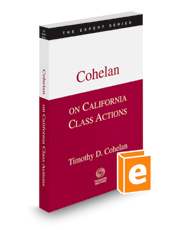 Called a “leading practical treatise” by the California Court of Appeal, Cohelan on California Class Actions covers both substantive and procedural law, explores the history of California class actions, and includes prerequisites for filing this type of suit in California. This book provides a step-by-step approach to initial case analysis, reviews potential problem areas, and contains sample forms and other summaries of requirements for class action practice. It also explores “pitfall cases,” attorney's fees, and making and opposing nearly every type of motion.